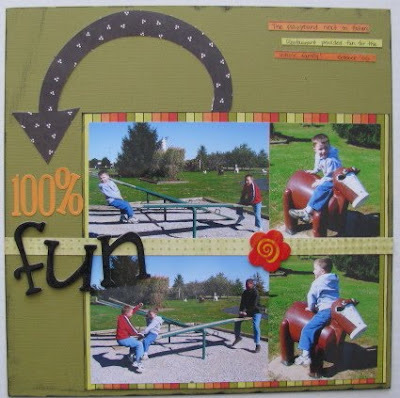 Memories by AmyInKy: Crop layouts!!! Last week Personal Scrapper posted a mini online crop. After using up the Eerie papers, I was a bit stumped on what to work on next, so the challenges were quite welcome. his new cousin Reese in late September. I always love challenges to use multiple alphas since I LOVE to mix my alphas. "100% fun" came together pretty quick. I switched back to the SR Salem line for this one. I was stumped on the "fears/phobias" challenge until I came across this spider photo in the photos I used for "one perfect fall day" (above). Both Blake and I are terrified of spiders, so I used this fun photo of a hay bale spider at the pumpkin farm to tell the story. 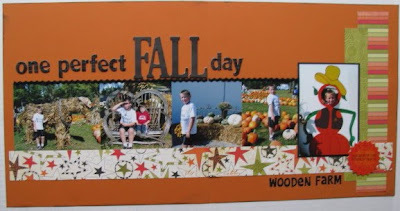 I was stumped for design inspiration, so I reviewed Shannon Zickel's gallery on her blog. I know she is great about leaving plenty of room for journaling. 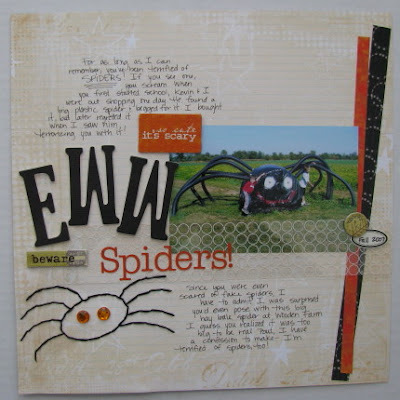 The hand-stitched spider was all my idea though! I drew it with pencil, poked the holes, then erased my lines. It didn't take as long to stitch as I thought it would - that was a good thing! 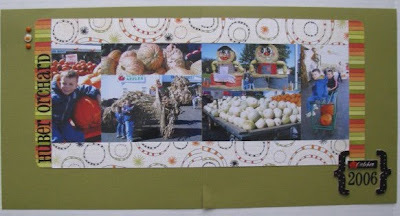 My last completed layout for this crop was for the "Mix it up" challenge to use five different products. Sticking with the SR Salem line, I used cardstock, patterned paper, stickers, chipboard adn brads. However, I wasn't able to get this one posted before the crop ended last night. My goal was to finish all ten challenges, but my body wasn't cooperating and chose sleep over scrapping. I had a migraine on Sunday and have been battling what is likely the "Kentucky Crud" since then. I've been going to bed early and trying to get a lot of rest. I hope everyone else is staying well!